As the youngest member of the Sagarmatha House family in Umbrella, Kopila is doted on by her sisters. And with a smile like that, it’s hard not to! Last week, the girls were having a conversation about what their names meant. Kopila told me that she likes her name but not what it means. “What does it mean?” I asked her. “Darkness, sister. And sometimes I am afraid of the dark,” she replied. Very understandable for a girl whose past is indeed a dark a one. In 2006, neighbours made reports of domestic disturbances in a local house in Swayambhu. When the police went to investigate, they found the house empty but for a locked door. Behind this locked door lay Kopila – living in dreadful conditions, malnourished, scared and totally alone. She was just 5 years old. She had been living with her father and stepmother but there was no sign of them nor was there any sign of her own mother. For Kopila, the future did not look bright. 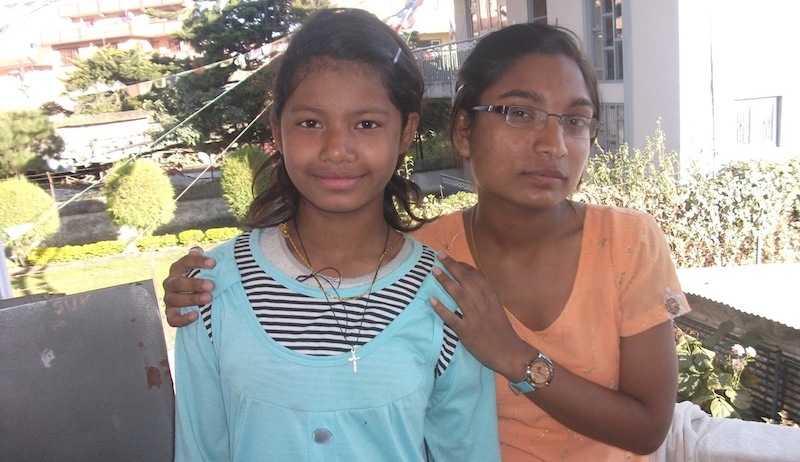 Fortunately, the police took Kopila directly to Umbrella where she joined the girls in the Sagarmatha House. She arrived a quiet, malnourished and neglected girl. She struggled with her school work. She was often described as being sad and lonely as she never had any contact with her family. Kopila a few months after being taken into Umbrella’s care. Sadly, as Kopila was abandoned so young, it has been difficult to find out information about her past. She has spent more than half her life estranged from her family. For Kopila, Umbrella is her family. She has relied purely on her Umbrella family for support and love. Kopila never takes this for granted and is always grateful to her brothers and sisters, both Nepali and international. Kopila with Juma, one of her first friends in Umbrella. They are still good friends today! Today, sitting next to her, it is so wonderful to see her grown up, healthy and happy with buckets of confidence – a far cry from the girl rescued almost 7 years ago. And Umbrella are so proud of her as she has been working really hard in school and she is now ranked first in her class! This year was Kopila’s first time spending Dashain outside of her Umbrella home. She accompanied Sita (an older girl in Sagarmatha House) to Sita’s family home in Kavre where she was welcomed warmly to celebrate the Dashain festival. She was so excited to talk about her holiday in Sita’s village and buzzing around while telling me all about it! 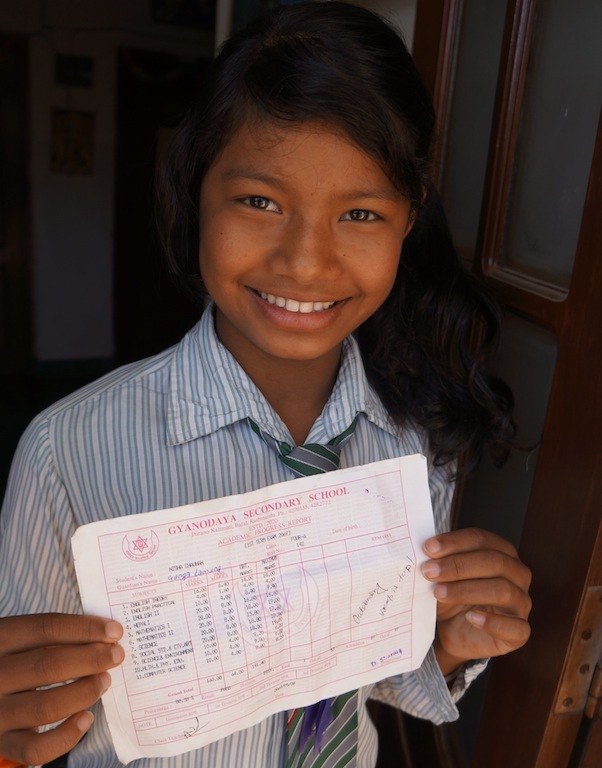 Kopila showing off her exam results! Me: So Kopila, welcome back! What did you spend your holiday doing? Kopila: Oh! Playing! Dancing! Singing! Teasing! Fighting! Kopila: Oh no sister! Just joking and shouting at each other! Me: Who were you shouting at?! Kopila: Sita’s bahi* – Ramesh. (*bahi means little brother). Me: Oh I see. I heard you made lots of friends in the village, was he one of them? Me:It sounds like you were having lots of fun. Did you watch any TV? Kopila: (Looks at me wide–eyed and exclaims) What? There is no TV in village! Me:Oh and you didn’t miss it? Kopila:No, I just didn’t care! I listened to the radio and put on what song I like and danced! 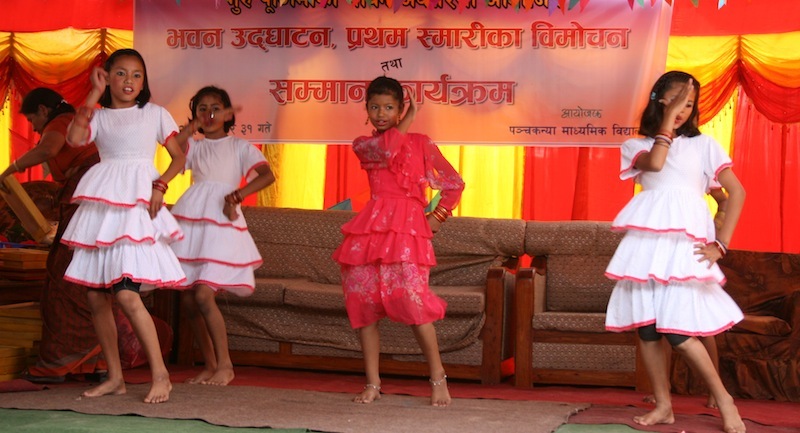 Kopila is an avid dancer and never shies away from an opportunity to dance! Here she is centre-stage at a school programme last year. Me:Did you eat any interesting traditional food for Dashain? Kopila: Mmm, I ate sisnu– one thorny plant. And dhedo! Kopila: Nepali national food. Made by maize. Kopila: Don’t ask sister! No need! Sooo tasty! Me:Haha. So what was your favourite thing you did during Dashain? Kopila: Going outside, crossing the river, playing in the water. All sister! Oh and climbing trees and picking amala. Kopila: That sour fruit I gave you sister. Me: Oh yes, thank you for sharing those amala with me! Very sour! So are you excited for next Dashain? Needless to say, throughout the whole interview Kopila was bouncing around and excited to tell me about her first ever Dashain in rural Nepal! Hopefully, she will have many more happy Dashain memories and maybe one day, with the continued help of Umbrella’s supporters, she will be able to celebrate Dashain with her relatives. Umbrella’s motto seems particularly relevant here: It is better to light a candle than curse the darkness. 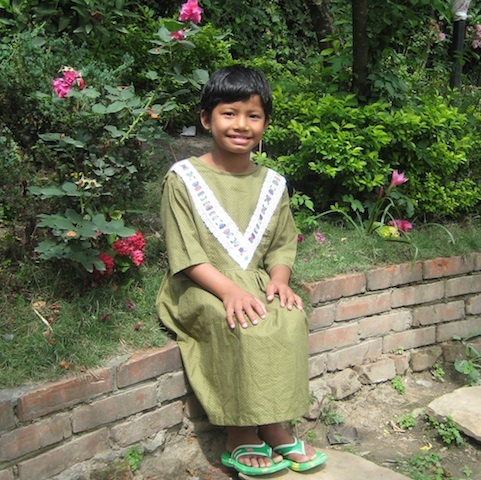 Kopila is one such candle, illuminating a brighter future for herself. Kopila with Sita, happy after a lovely holiday at Dashain!